What started out peaceful, turned pretty hard, though I really don’t know why. Slept in a little, plus the time changed, so I got a late start on both my time and clock time. Did have coffee at the Clevedon Cafe before hitting trail. Was nice easy warm up 7 km on gravel road gently sloping up, then a nice, but fairly muddy track along a river. About midday, the trail got very steep, muddy, slippery and slow. Stayed that way for a lot of the rest. Much of the day was looking out over two large reservoirs. Had lunch at a dam, and there met two DoC volunteers where were re-supplying the Kauri disinfectant stations– there is a disease hitting Kauris so there are shoe disinfectant stations at the entrances to trails running through kauri forests (I had not realized there were still kauri forests south of Auckland). Anyway, these guys stopped to chat, both sporting really long grey beards. Made me think if mine were longer, we could have started a ZZTop cover band. The road up from the dam was good, until I hit a forestry track that was listed as closed because of active logging, even though it was the only way through for the TA. None of the directions were clear– roads were listed the Te Araroa directions by name, but no names on any of the maps. It was Sunday, the logging trucks were not running, so I walked it anyway, which was fine until the heavy equipment rerouted it. That put me on a temporary bit of the TA, which was a lot of slogging. In all that mess I either missed the turn for the campsite Where I had planned to camp, or it has dissolved in lumber company mud. Whatever, I found myself past the point where the site was supposed to be, out of water, with night falling. 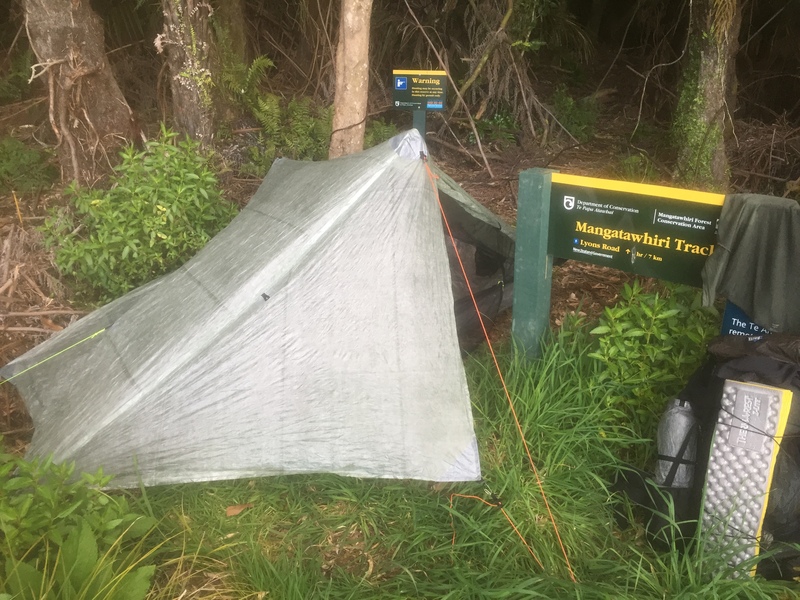 Had to pitch tent in only flat spot– a little bit of the trail. I wasn’t worried about anyone coming by, as I was a long ways from everywhere. Water is a bit of a concern. Can’t cook anything, and obviously drink either. There is a river 6 km down the trail, so I just have a couple hours hike in morning to refill. Exhausted, went to sleep with the sun (actually the moon and then the rain).